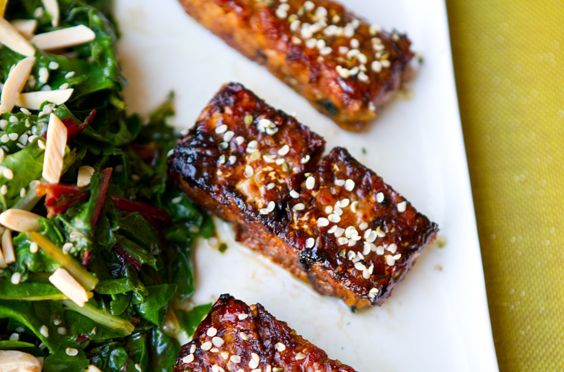 Sticky Blackened Tempeh, Cider Vinegar Chard Lunch. I'm always looking for a few good recipes to pull out around lunchtime when I'm hungry, busy and craving something delicious. 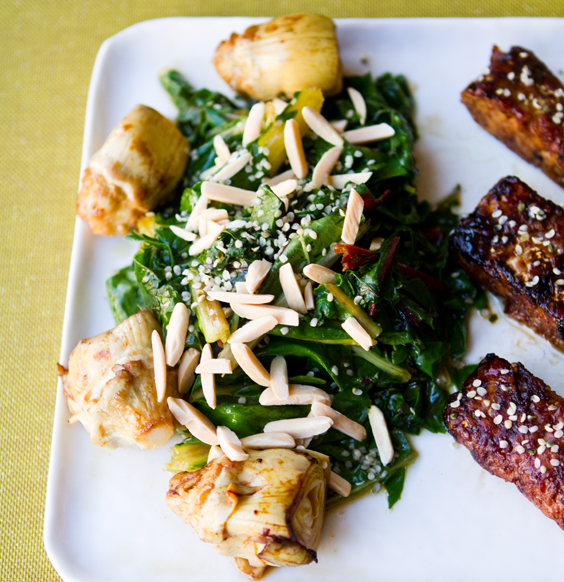 This Sticky Sweet Blackened Tempeh with Apple Cider Vinegar Chard, slivered almonds, charred artichoke hearts and accented with raw hemp seeds, fits my needs for a healthy lunch that makes me happy. There is something energizing about munching on some zingy greens in the middle of the day. 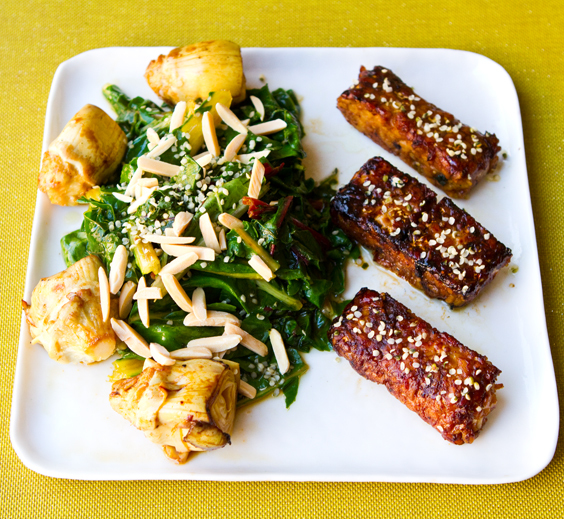 Paired with the protein rich tempeh - this plate is one to crave. Try it for yourself.. Lunch. Do you skip it? Do you love it? Do you ever treat yourself to a "hot lunch" or is it always something cold? Lunch is one of those meals that takes finesse to master. It's not so hard to take a lunch break and eat your meal, but it's everything that leads up to that moment of "lunch" that takes some planning.. If lunchtime rolls around and you don't have a plan, you are likely to grab whatever seems fast, easy and somewhat yummy. But if you can find a way to squeeze some truly good for you foods in at lunchtime (like greens, legumes, whole grains, fruit and more veggies) your body and energy levels for the rest of the workday will thank you. For this lunchtime platter, I was craving three things: greens, protein and apple cider vinegar. I use Eden or Braggs brand of raw, unpasteurized cider vinegar. For the greens (nutrient powerhouse), I lightly steamed them in a very small splash of olive oil - for literally a minute. And yes, that small pile of lightly wilted greens is one whole bunch of organic rainbow chard! Hooray to that. Then I left my pan on and quickly sauteed my tempeh cubes and gave my artichoke hearts a quick charring as well on the still-hot pan. Greens Nutrients (in one bunch, about 6 leaves): rich in fiber, vitamin A, C, B6 and K. Good source of iron, potassium, folate, magnesium. One leaf of chard contains 498% RDA for vitamin K! This meal has a salty, zingy, sweet and warm appeal to it. 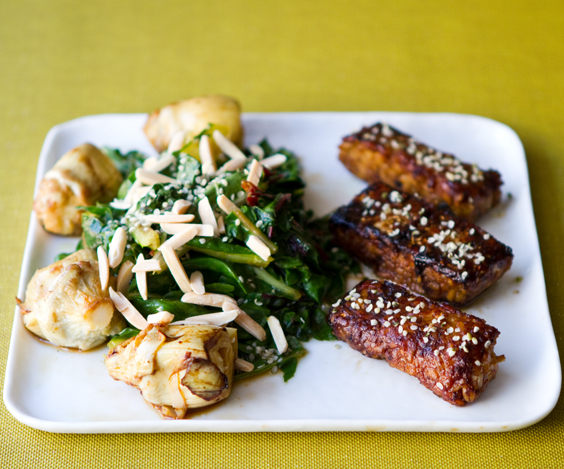 That sticky sweet tempeh with a slightly appealingly bitter taste pairs perfectly with the oft sweet and zingy chard. The hemp seeds are an excellent way to squeeze in more protein an nutrients. 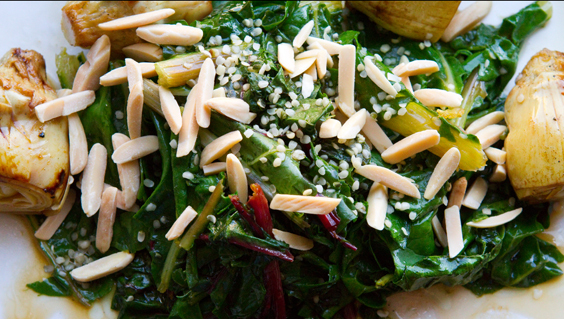 Those crunchy slivered almonds add texture to the greens dish - as well as nutrients like vitamin E. The artichoke hearts were just a nice accent bite to have - balancing out the sweetness of the rainbow chard greens. Have you tasted raw chard lately? It's quite sweet! What do you squeeze in (or savor) for lunch? Hot or cold? Healthy or rushed? Any lunchtime rituals you would like to share? I'd love to hear them! 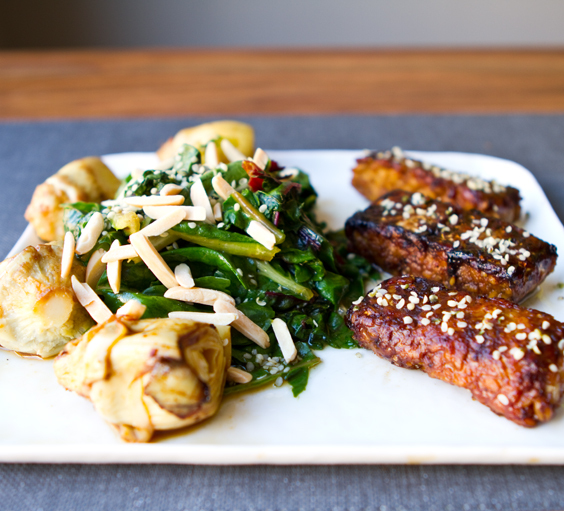 Note: for the recipe below, I use one whole package of tempeh - which gives you about 6 logs. You will have leftovers. You can chill in fridge for a yummy tempeh wrap later - or share with a fried - or eat them all if you are hungry for them! 1. Turn a skillet to medium. Add the olive oil. Add in the chard and a tsp of the apple cider vinegar. Cover with lid. Let cook for about 1 minute. Quickly lift lid and stir greens around, wilting them with the steam and hot pan. Remove them. They will continue to wilt a bit after you remove them. Toss them with the remaining apple cider vinegar. Place on your plate. Top with a sprinkle of hemp seeds and almonds. Note: I toss the greens with the vinegar after cooking so that the cider vinegar stays raw and uncooked - in its pure state. Also note that if you want to keep the chard 100% raw and just chop and toss (no wilting) - go for it! 2. Turn your pan to high and add in the safflower oil. 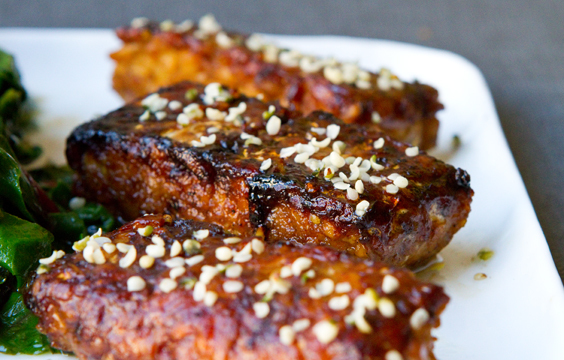 When hot, add in the tempeh logs and splash them with maple syrup and tamari. Cover with lid as the tempeh sizzles and steams for about 30 seconds. Remove lid. Flip tempeh. Allow all sides to get a black char from the heated maple and tamari mixture. When tempeh seems just about ready, add the liquid smoke evenly. Lastly, with the pan still hot, add in the artichoke hearts. Allow the leaves to lightly char for about 30 seconds. Turn off pan heat. Remove the tempeh from the pan and place on plate. Top with hemp seeds. Lastly, remove the still warm artichoke hearts and place on plate. More lunch inspiration! 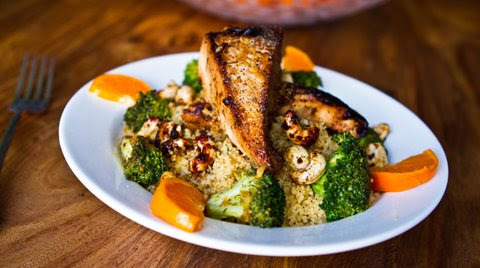 Tofu, broccoli, cashews and couscous (photo below) would make an awesome re-heat/leftovers from dinner lunch bowl - Get the recipe here!..